You may have remembered that our initial goal was to emphasize the “Minimum” in Minimum Viable Product. And that’s what we did – scraped some resumes for keywords and built a rudimentary machine learning model. Translation: We needed to develop a more robust machine learning model. This is where the whole machine learning thing gets tricky. There are all kinds of algorithms out there capable of doing all kinds of things. Some are better in some situations; some are better in other situations. What does your data look like? How much do you have? Are you discovering or predicting? What kind of output do you want? And just to make things even more completely and totally maddening, they all have multi-syllable names, oozing with mathematical and whimsical buzzwords. A few of my favorite gibberish examples include Boosted Decision Tree Regression, PCA-based Anomaly Detection, Fast Forest Quantile Regression and Multi-class Decision Jungle. So what’s a girl to do? Obviously, Google the crap out of it. Fortunately, I found plenty of resources on the interweb to hold your hand during the machine learning algorithm selection process. Unfortunately, most required a depth of understanding that I was still in the process of developing. And, just to add another round of complexity, the Artificial Intelligence field is evolving feverishly, and thus no one source is authoritative or comprehensive. Some sources listed some algorithms, but left out others. Some sources contradicted others. Some sources made completely no sense at all. Are we trying to detect anomalies? Nope. We’ll save outlier detection for a rainy day. What’s more important improved accuracy or reducing training time? Since we have a small data set, training time is less important. Accuracy FTW! The eventual winner… Matchbox Recommender! I have no idea why it is called that. But it is kind of a fun name. I will take saying that over “Two-class Averaged Perceptron” any day. It is basically a movie recommendation algorithm. Probably fitting, since this whole project was inspired by Netflix. The main aim of a recommendation system is to recommend one or more items to users of the system. Examples of an item could be a movie, restaurant, book, or song. A user could be a person, group of persons, or other entity with item preferences. In all honesty, I have read those Microsoft paragraphs a kazillion times, gaining 1-2% of insight each time. I estimate I have finally crept over the 50% comprehension threshold. Making decisions is always tough. And it is even tougher when you are still learning the underlying technology required by those decisions. Innovation projects layer on yet another degree of difficulty. It is like you are asked to make a decision while on a treadmill. You prefer to hit the pause button, take a deep breath and make sure you have done a comprehensive evaluation before making a decision. But instead, the treadmill of new technology rolls on at 10 MPH. You have to make the best decision you can at that moment, hold onto the guardrails, and hope your legs keep up with the pace. 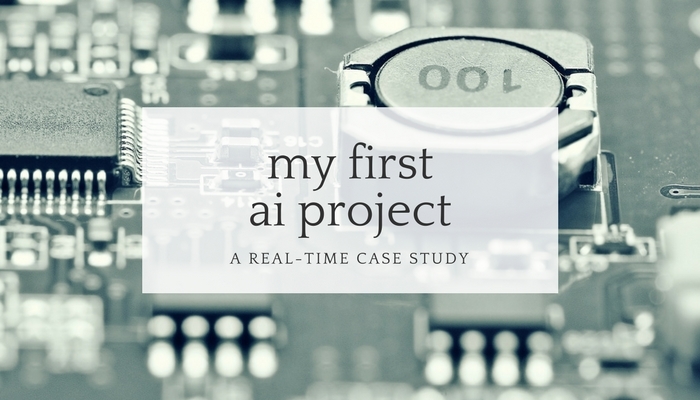 This is the eighth installment of my real-time case study on my first AI project. I plan to share what we are working on, what is going well, what is sucking at the moment – everything – as it happens.